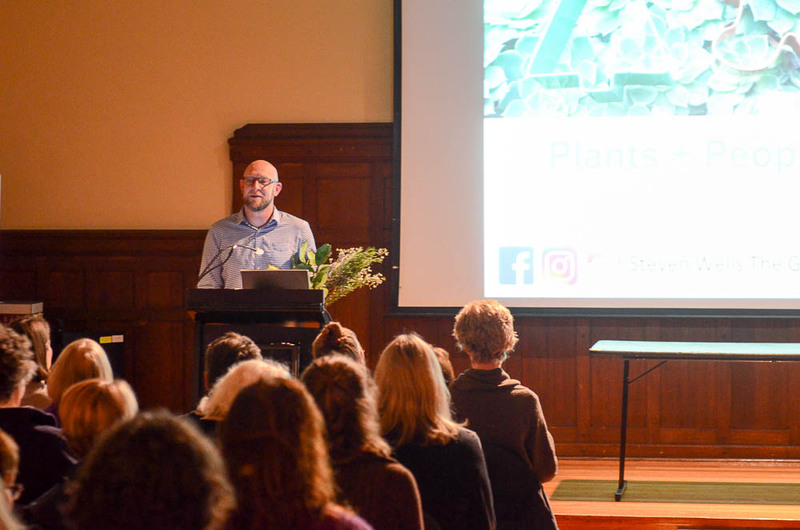 On the evening of 13 September, more than 80 garden enthusiasts came to Mueller Hall, eager to hear Steven Wells talk about his recent Churchill Fellowship tour of therapeutic gardens in hospitals overseas. Steven is well known for establishing the horticultural therapy program and the sensory and healing gardens at the Royal Talbot Rehabilitation Centre in Melbourne. He was awarded a Churchill Fellowship in 2015, which enabled him to travel overseas this year to research the development, use and management of therapeutic gardens within healthcare settings in Singapore, the UK and USA. Steven explained how the gardens he visited provide powerful and positive spaces for respite, meditation and refuge from the usually sterile hospital environment. Often these gardens also form part of patients’ treatments, whether it be occupational therapy or as part of the transition from hospital to returning back to ‘normal life’ at home. Steven illustrated some examples in his slideshow, such as the Spalding Rehabilitation Hospital in Boston, where moving rocks are placed on posts as a therapy tool for patients with a brain injury. At the same hospital, a putting green has been installed – a great tool for treating patients who are trying to re-establish their balance and also to build confidence and re-introduce an activity that patients might like to return to when they go home. At the Khoo Teck Puat Hospital in Singapore, Steven witnessed how the gardens there have achieved more than just fostering and promoting human health. These amazing hospital gardens have also improved the ecological health and biodiversity surrounding the hospital by encouraging dozens of species of birds, fish, butterflies, dragonflies and other insects to live there. In this same hospital, an urban farm has been created on the 7th floor rooftop, in just 500-600mm of soil, producing fresh fruit and vegetables for patients’ meals and surplus sold to the public – how wonderful! Farming on the 7th floor rooftop at Khoo Teck Puat Hospital in Singapore. A recurring theme described by Steven, is the desire to create spaces that foster a ‘home-like’ environment for patients and their families – somewhere you don’t feel like you are ‘in hospital’. At the Ulfelder Healing Garden at Massachusetts General Hospital in Boston the rooftop garden situated on the 8th floor is a serene and calm space for cancer patients and their families to enjoy. Built 11 years ago, this is a garden of sanctuary and respite with trees and views out to the city and river. Steven shared how patients had described that spaces like this had ‘given them their lives back’. The Ulfelder Healing Garden at Massachusetts General Hospital in Boston. Steven spoke of how landscape designers are now eager to be involved in therapeutic garden designs. In the UK, notable designers such as Dan Pearson and Cleve West have been behind hospital garden design. Steven showed photographs of two gardens exhibited at Chelsea Flower Show that will now be installed at two separate hospitals in the UK. Steven also explained some of the ‘nitty-gritty’ of successful therapeutic garden design and how all aspects of the gardens, including paving for example, need be designed with the end user in mind. Smooth ‘bumpless’ paths without concrete lips are essential for wheelchair-bound patients with spinal chord injuries. And for patients who can’t make it outside, or where frozen winters make it impossible to venture out, large ceiling-to-floor windows allow people inside to be connected with the spaces outside. engagement with experienced landscape architects and/or garden designers ensures a greater long-term success for the design, use and management. Steven was extremely generous with his time, taking many questions from the audience and staying on to chat afterwards. Steven’s report will be published in due course on the Churchill Trust website.